"Reflections for a day in June"
What is so rare as a day in June? It must have been a beautiful sunny day like today when another writer of the past wrote this. As a small boy growing up on the Six Nations Reserve, I recall another such day back in the 1930s. My two smaller brothers and I had trailed behind my father as he headed back to our sandy garden one morning. There were straw­berries, potatoes, onions and other crops to hoe. And there was plenty of sand for small boys to play in. The trail to the garden led downhill and around a large pond beside the Boston Creek. Then it went over a small hill and through a grove of oaks and hickories where a colony of flying squirrels lived. The path had been made by our half-dozen cattle and was well worn. It led past the small sandy field which was perfect for a garden. The rest of the farm was Haldimand clay. At noon, my father broke off his hot and sweaty work and he went down to the creek. It often went dry in summer but a recent heavy rain had made it rise about three feet. It was now running clear and cool beneath the shady trees. He knelt down by the edge and took a long drink. We did the same. Then a wonderful thing happened. He asked us if we wanted to go in for a swim. Does a rabbit like lettuce? In a minute, we had flung off our clothes and we were splashing about in the chest high water. After a good cooling off, we headed back to the house for our mid-day meal, which we called dinner. The evening meal was called supper in those days. Another difference back then was that drinking water was free and plentiful. Our well never ever went dry, even when we used it to give water to the chickens, pigs and calves. This is no longer true of wells on the reserve. 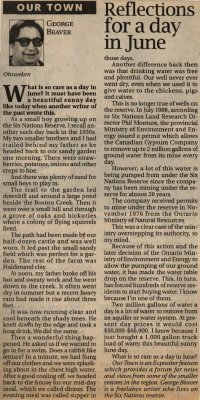 In July 1988, according to Six Nations Land Research Director Phil Monture, the provincial Ministry of Environment and Energy issued a permit which allows the Canadian Gypsum Company to remove up to 2 million gallons of ground water from its mine every day. However, a lot of this water is being pumped from under the Six Nations Reserve since the company has been mining under the reserve for almost 20 years. The company received permits to mine under the reserve in November 1976 from the Ontario Ministry of Natural Resources. This was a clear case of the ministry overstepping its authority, to my mind. Because of this action and the later decision of the Ontario Ministry of Environment and Energy to allow the pumping of our ground water, it has made the water table drop on the reserve. This, in turn, has forced hundreds of reserve residents to start buying water. I know because I'm one of them. Two million gallons of water a day is a lot of water to remove from an aquifer or water system. At present day prices it would cost $50,000-$60,000. I know because I just bought a 1,000 gallon truck load of water this beautiful sunny June day. Our Town is an Expositor feature which provides a forum for news and views from some of the smaller centres in the region. George Beaver is a freelance writer who lives on the Six Nations reserve. Six Nations Land Research ; Ontario Ministry of Environment and Energy ; Canadian Gypsum Company ; Ontario Ministry of Natural Resources.